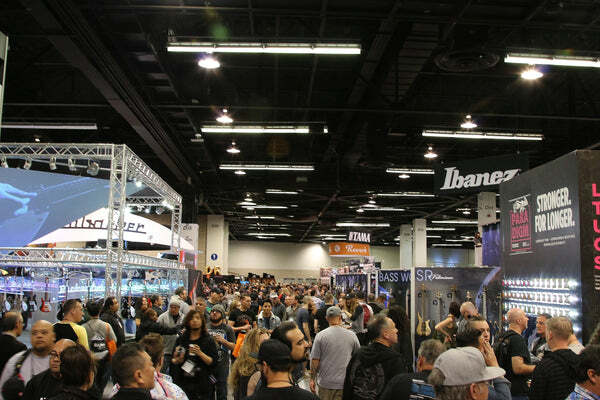 As many of you may know, the NAMM Show begins this coming week -- specifically on Thursday, January 24. I will continue to keep Proteus' seat warm and provide some reports and photographs from the Show since he won't be making it out to this one. I think, however, that he needs to come back so that that these NAMM reports will have a bit more panache to them again. You can be assured that I will provide reports on everything new from Gretsch this year. But, what else would you like to know about from the Show? If you have a specific item that you are interested in, or a specific question that I can answer by going to visit the vendor and researching it with them, I will try to get to as many of them as I can. So, what are you interested in learning about from the 2019 Show? Post your questions in this thread and I will refer back to it during the Show whenever I go out onto the convention floor to check things out. I will be excited to hear and see the action. Thankful you will do the legwork and feed us the eye candy, Ric. Thanks again Bob! Of course new offerings from Gretsch are the main focus but maybe inquire of Joe what the status of archtop model are, if at all. While on the archtop theme, in your wandering, maybe you'll notice some other company's versions. Is there any builder that particularly interests you? The “two T’s” please — that’s TVJones and T K Smith (if he’s even there). Waldorf Music is introducing a massively powerful new synth developed by an independent designer in the UK. It was known as the Valkyrie when the builder took a prototype to MusicMesse last year to attract a production partner, and Waldorf is now building it under the name Kyra. Based on a Field-Programmable Gate Array processor (about which I know nothing whatever), it seem to be almost logarithmically more powerful than any previous synth. Like 128-note simultaneous polyphony, splittable up to 8 vocies, with two groups of 32x oversampled oscillators per voice, out of 1,280 total oscillators. Dual PCM wavetables with 4,096 waves, ring mod, FM, and modeled analog filters. Nine-module effect unit, 3 stereo LFOs with 64 wave shapes. I don't care about the specs, which have already been covered by the trades - but more the aural experience of hearing the thing. The quality of its sound, depth and richness. I was lucky enough to be at the early 90s NAMM when Kurzweil introduced its stunning sampling technology, and a few years later when Roland rolled out the D-50. These machines all represented paradigm shifts in synth technology, and birthed new lineages of machines. I think the Kyra is going to do the same thing. Earlier this year Moog introduced their be-all end-all current highwater mark of analog synthesis, incorporating everything the company has learned in 50-plus years, the very expensive Moog One. It will be the centerpiece of Moog's pavilion, and I'd be interested in sonic impressions of that machine as well. I know we're all about guitars, but I generally know what those sound like. These new synths plow some new ground. So if you have time. Of course we'll all be interested in what's happening with Gretsch. I know there are new introductions beyond the Electromatic Juniors, and I know you'll attend to that stuff. I suspect all guitarists are also curious not only about what Gibson's re-born line looks like, but price points, and a general sense of how the new Gibson is being received. And if Jimmy Page happens to appear for Fender, as I bet he will, and you get some time with him, tell him I said hi and I still want to know how he does the intro of "Dancing Days" so smoothly. Also, that now that I've discovered how easy "Kashmir" is to play (in its alternate tuning), I'm even more stunned by its clever simple brilliance. Do NOT come up with any must-have pedals. I need no more such things. While you're NAMMing, I'll still be working on a redesign and remote-pagination transition for a newspaper in North Carolina (where I am now). I'd rather you were there as well, pal. Bob, I'd like to see you report on new electric models from Gibson, Epiphone and Guild, particularly the Starfire 12 string. Also any new acoustic models from Gibson, Martin, Taylor and Larrivee. Bob, thank you for offering to report back from NAMM on things we are interested in. I’m with Don, I’d like to hear back on the acoustic and electric archtop offerings from Guild and Epiphone if there are any new models. If you come across any Vendors of vintage Audio, Cassette, Recording gear, etc., please grab a business card...Thx. I’ll look into the synth, maybe Mel has an in with Waldorf Music. Besides the usual Gretschmania, I expect to spend a bit of time at the Reverend, Quilter, and Eastman booths, as well as navigating the myriad pro audio vendors, and as much time in the musical goofy-land known as Hall E as I can manage. Also looking at Martin, Godin, (maybe) Taylor, D’Angelico, Gibson, Córdoba/Guild, oh hell, I’ll be looking at everything with strings that isn’t a cello. Maybe I’ll count how many overdrive pedals are on display, but I won’t discuss any details, for Proteus’ own good. I also hope to get down to the guitar show at the fairgrounds to see what, if anything, is happening there (I’m sure the Gretsch Bikini will be on display if anyone wants to buy it). Maybe on Saturday, since NAMM is a zoo that day. The Reverend after-party should be a hoot, with Greg Koch showing off his new signature model, and Reverend tends to attract some fine players. Candy will be available for those who need it. Wouldn’t be NAMM without it, right? Bob, thanks for whatever you're able to report on. It would be far easier for you, to just go and enjoy it all, so I do appreciate your time and efforts "spreading the cheer" with all of us. Travel safely and have a hoot. I make a point to stop by the Waldorf synth booth every year, and I still haven't gotten any free swag! Thanks again Bob,looking forward to your coverage again this year sir! See if Gibson’s released the Alexa fitted ES-335 they’ve been touting. I would like to know if that Strymon Volante delay pedal actually sounds like it does in the demos. Curious about the new Les Paul Junior and Les Paul Standard (p-90 version), especially your impression of the build quality and price. If you have a chance, of course. Thanks! As my other thread may suggest, I'd be curious if the Epi George Thorogood Sig model made it's first appearance at the show. Bob -- Many thanks, again, in advance for your efforts and willingness to share with us. I truly look forward to your reports! If you happen to notice any trends regarding tone woods. If manufacturers try to use alternatives to rosewood to a larger extent than earlier, for example. Or if they don't.